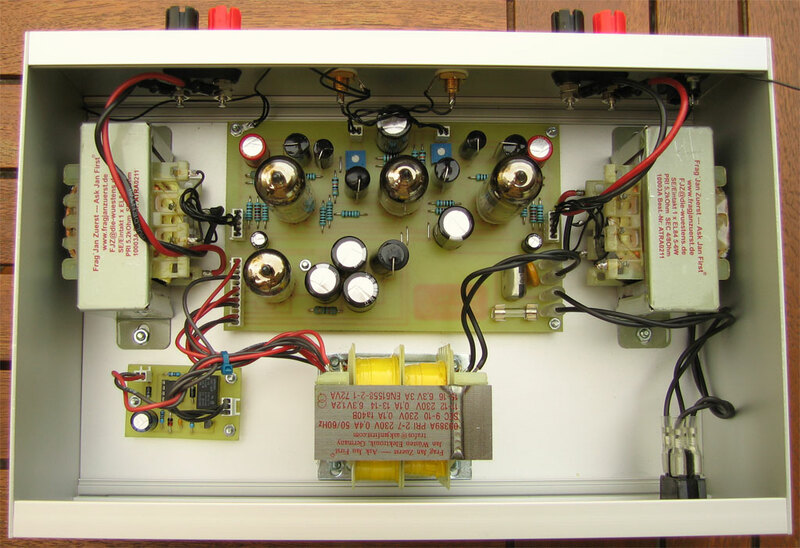 I have build an EL84 class A amplifier in triode configuration. The amplifier has a very nice soft warm sound, with a good amount of bass. The amplifier however has some blue light in the EL84's. I have mounted grid stoppers on the ECC83 grids and have read on the web that it is normal for pentodes as EL84 and EL34 to have some amount of blue light, it is also common for old NOS tubes like mine to have some blue light. The amplifier also hum a little bit (100Hz), I will not do anything about this. At last I have added a small 30 sec. delay circuit to delay the high voltage switch on. Update! My brother has also build a version of the EL84, check out the pictures of his version below. Picture of the finished EL84.